About a month ago, we got our first vague glimpse at an all-new version of Rockman from a company called the Fields Corporation called Pachislot Rockman Ability, a pachislot game due to be released in Japan in September. Since then, a bit more information has come out, including an official web page! Unfortunately, most tabs are marked as "Coming Soon." Worse still, the majority of the text is part of an image, so Google Translate will be of no use to us here. Fortunately, Protodude has been on top of things, so here's a quick round-up of the more interesting highlights. In terms of characters, we saw the likes of Rockman and Blues in the original peeks, as well as a host of others. In these character renders, we get another look at Rockman, his sister Roll, and his other sister, Trancy, who is an all-new character created for this title. Meanwhile, the much younger Dr. Right we can see in the first image above is now a woman voiced by Mie Sonozak, who has previously served as the voice actor for Crimson Viper in Street Fighter IV and Arle Nadja in Puyo Puyo. On the other side of the coin, we see a Dr. Wily who has put less into his moustache and more into the hair on top of his head. He's joined by Blues and an assortment of Robot Masters, including Coin Woman, Lever Man, Choice Man, Reversi Man, and Replay Man -- each based on a different aspect of pachislot play. 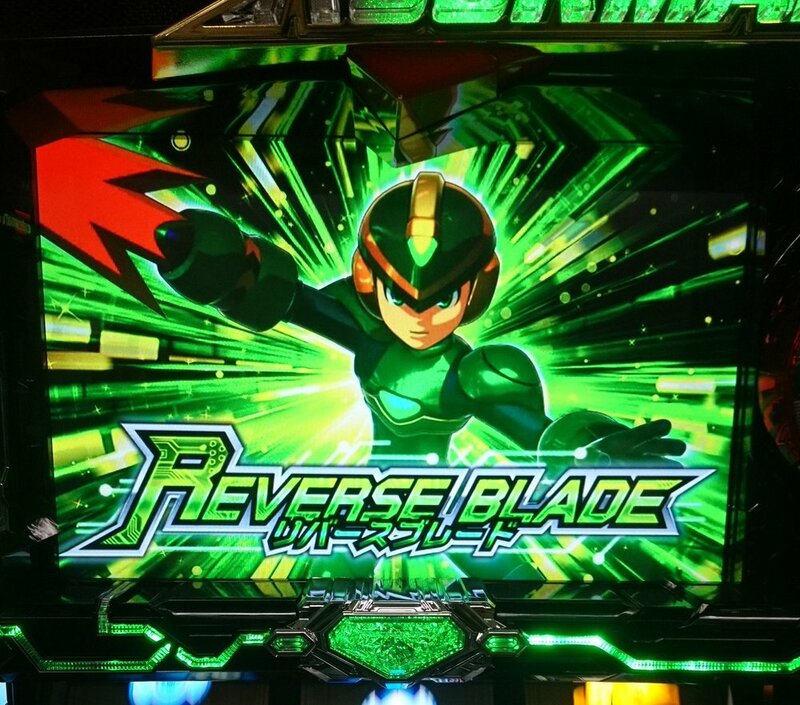 As one would expect, Rockman is able to acquire the powers of the Robot Masters, such as the Reverse Blade from Reversi Man, seen above. While it's unknown what it actually does, speculation suggests that it reverses the machine's roulette wheel. 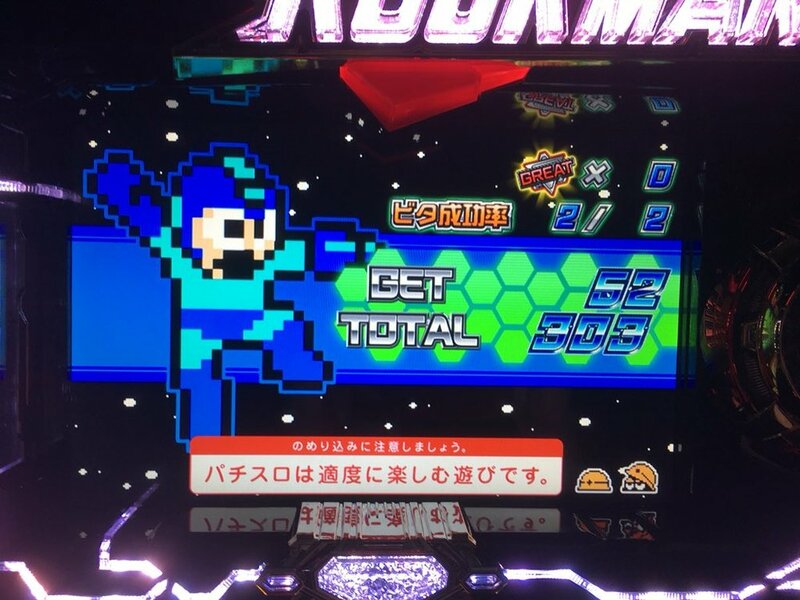 Finally, @yamato_nare on Twitter got a chance to play the game before its official release, and caught a few snapshots of pixelated versions of the Rockman Ability heroes playing a Classic-inspired mini-game called "Regular Bonus." And that's pretty much it for now! As noted before, the Spiky-produced game will arrive in finer pachislot establishments in Japan next month, and there doesn't seem to be any word of a western localization (were we expecting one, though?) as of yet. If you hear anything more on this, or anything else Mega Man (or Mega Man-esque) for that matter, feel free to drop me a tip using either this form (located under the "Site Features" tab at the top of the page) or by sending an email to the.mega.man.network (at) gmail.com!